A new computer-vended postage stamp began appearing in select United States post offices in late October. The stamps vend from self-service kiosks. A new computer-vended postage stamp for the holiday season has arrived at many United States post offices. The full-color forever stamp reuses the design of one of the Holiday Windows forever stamps issued Oct. 6 in New York City. The design by illustrator William Low is a slightly cropped version of his Wreath stamp design from the Holiday Windows set of four. It pictures a decorated Christmas wreath with large red bow hanging outside the window of a home. The design includes falling snowflakes and snow accumulating on the wreath. The holiday design is preprinted on otherwise blank labels that are loaded into self-service kiosks located in selected post offices. The nondenominated (47¢) “forever” inscription, two-dimensional barcode, and number sequence are printed on the label when the customer purchases the stamps from the kiosk. The new stamps were sighted in some post office kiosks on Oct. 27. The computer-vended stamps are listed in the Scott Specialized Catalogue of United States Stamps and Covers. The Scott U.S. Specialized catalog’s Computer Vended Postage Stamps section underwent a significant expansion in the recently released 2017 edition. Festive Holiday Windows stamps to shine at ASDA show in New York: The four Holiday Windows forever stamps comprise the Contemporary Christmas issue for 2016, with four scenes depicting familiar holiday decorations. During the course of the year, most post office kiosks vend a forever postage label with Flag design that was first issued in 2014 (Scott CVP91). The Wreath labels are replacing the Flag design, presumably through the holiday season only. In past years, the Postal Service has resumed using the Flag design at the beginning of the new year. Computer-vended labels with a holiday theme have been produced each year since 2012, when a mailbox filled with wrapped packages served as the design (Scott CVP88). The annual holiday label designs regularly corresponded to previously issued Christmas postage stamp designs. The 2014 holiday label showed Rudolph from the 1964 Rudolph the Red-Nosed Reindeer television special (Scott CVP92). Characters from that special also were featured on a set of four forever stamps issued Nov. 6, 2014 (4946-4949). 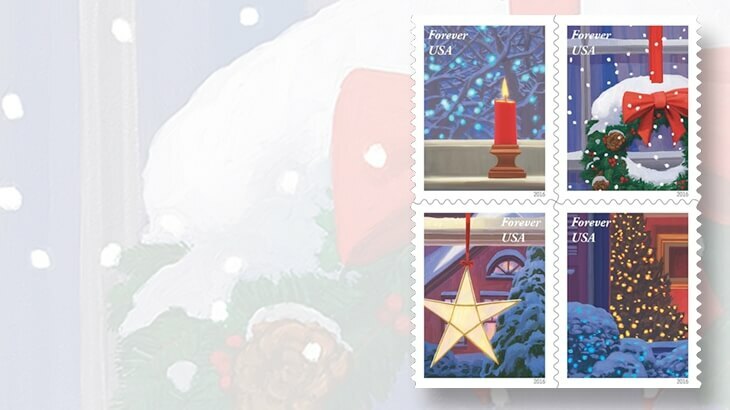 The 2015 stamp (Scott CVP98) repurposed one of the images from the set of A Charlie Brown Christmas forever stamps (5021-5030). Not all post offices have the self-service kiosk that dispenses the computer-vended postage, and those that do might not have the new Wreath stamp available. Collectors interested in obtaining the new Wreath computer-vended postage stamps can look online for a post office location that has a self-service kiosk installed. Visit the USPS Tools website and look for the Quick Tools link at upper left. Click the link and select Find USPS Locations from the drop-down box. On the next screen, under Location Types, click the down arrow and select Self-Service Kiosks from the drop-down menu, enter a city and state (or ZIP code), select a distance radius for your search, and click on the search button. The Meter Stamp Society is one philatelic group that studies U.S. computer-vended postage and similar issues. For additional information, visit the society’s website. Nativity forever stamp issued at St. John’s Church in Washington, D.C.